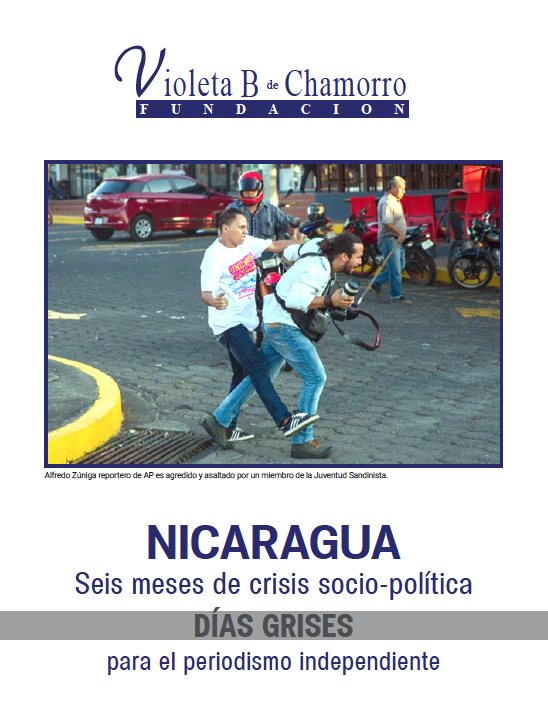 There have been 420 violations against of press freedom since protests began in Nicaragua last April, according to a new report from the Violeta Barrios de Chamorro Foundation (FVBCH, for its initials in Spanish). The organization looked at the period from April 1 to October 18, 2018 and found violations including aggressions, attacks, threats, defamation, censorship, judicial harassment, intimidation, verbal harassment, misogyny, death and others. Taking all violations into account, there were 261 victims. In the report, the organization details each violation, including date, name, gender, geographic location, a link to an article, type of work, type of violation, aggressor and a description of the case. According to the report, the highest number of violations took place in July (111), most victims have been men and most violations have been aggressions (18%), attacks (16%) and intimidations (17%). In 38.57 percent of violations, FVBCH reported that militants of the Sandinista National Liberation Front (FSLN) were the aggressors and that the next highest percentage were the National Police (18.57%). And a large majority, 45.71 percent of violations, occurred in the capital of Managua. The most serious violation included in the report has been the murder of journalist Ángel Gahona who was killed in Bluefields on April 21 during a Facebook Live broadcast of protests. A total of 14 media professionals, along with priests, were allegedly attacked by sympathizers and paramilitary members of the government party during coverage of the arrival of members of the Episcopal Conference, according to FVBCH. Following the period that the report considers, on Oct. 29, Miguel Mora, director of the channel 100% Noticias, denounced through his Facebook profile the removal of the channel’s signal from the platform of subscription television channels by order of the government. The Nicaraguan Institute of Telecommunications and Correspondence (Telcor) sent a communication to the companies of that platform ordering them to broadcast channel 6, a state signal, in the frequency of channel 15, where 100% Noticias is broadcast. The IACHR viewed the measure against 100% Noticias with concern and recalled that during the April protests, the media outlet was off air for six days because of the government’s imposition, because it did not stop broadcasting programs perceived to be oppositionist. On Oct. 31, a journalist from León, Álvaro Montalván, was detained for 48 hours by police and has said he was stripped naked multiple times and “offered as a trophy” to prisoners, according to Confidencial. "If this happens to the men and women who have access to the media, what will happen to people who do not even know the telephone number of a journalist," said Montalván, director of Radio Mi Voz, who also pointed out that the margin for exercising journalism in Nicaragua is decreasing, Confidencial reported. The FVBCH condemned the “censorship” against 100% Noticias and repudiated the “arbitrary imprisonment” of Montalván. “The FVBCH again repudiates these types of abuses against independent journalism, which add to the long list of more than 420 cases of violations to press freedom during the period of the socio-political crisis that started last April,” the organization wrote. Regarding support from the international community, Lacayo pointed out that international organizations like the Inter American Press Association (IAPA), Reporters Without Borders (RSF) and the Inter American Commission on Human Rights (IACHR), have documented violations to freedom of expression in the country. “The international community can help independent journalists in Nicaragua with conferences about personal safety in risk areas and with personal protection equipment like bulletproof vests and helmets,” she said.